This is a special episode of the Amazing Teacher Podcast. It is the final episode. Yes, this is the last episode. I have had a great year of inspiring interviews with amazing teachers, and as much as I have enjoyed putting on the podcast, I feel it’s time to bring it to an end. I know that I have become a better educator after picking the brains of these amazing teachers, and I have received so many messages from the listeners who have told me that they also have found great value in the podcast, so I’m happy about that. I would like to thank all of the subscribers who have supported the podcast by sharing it with your friends and colleagues. I especially want to thank the 31 amazing guests who have taken time to sit down with me and share their experience and expertise and their heart and their passion for teaching and love for students. I have been so inspired by all of you. I don’t want to close the door completely. You never know. I might post another podcast in the future, but for now, this is the final episode. So I thought, who would be a great guest for the final episode? Why not interview the teacher who inspired this podcast? 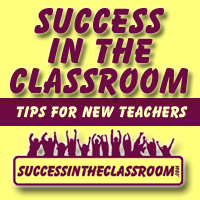 If you heard the very first episode of the Amazing Teacher Podcast, I share how I was sitting with one of my colleagues at my school, and she was sharing her insights on teaching, and talking about what she does in her classroom, classroom management, connecting with students, etc. And that’s when the podcast idea came to me. 31 podcasts later, here we are. 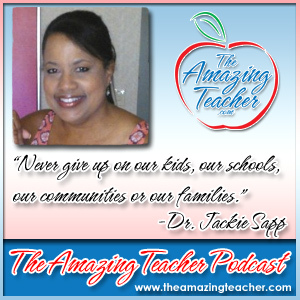 So I am happy and honored to have my colleague and friend Dr. Jackie Sapp on the podcast. We had an amazing conversation, and she shared some advice and tips that I know you will find valuable. She also shares with the listeners about an incident that happened last year that she considered one of the most difficult times in her life, and it is truly inspiring how she was able to go through this episode in her life, and still be that amazing teacher for her students, so listen for that. Listen also for when we talk about the “hug line.” That is good stuff right there – showing how important it is to show your students that you care about them. I had an incredible time speaking with Jackie. We could have gone on for another two hours just talking about how to best connect with kids. Jackie is truly an amazing teacher, and I know that you will find what she shares both valuable and inspiring. Again, I want to thank you for listening to the podcast. It has been one of the most inspiring years of my life. I would love to hear from you. Let me know how the podcast has helped, what value you have found. The emails and messages on Twitter I receive always make my day. You can email me at sam@theamazingteacher.com or send me a tweet at @amazingpodcast. Thank you for spreading the word about the podcast.